I scream, you scream, we all scream for ice cream! It is National Ice Cream month for the month of July, with July 21 being National Ice Cream Day. So go to your local ice cream store and take part in this delicious treat and for those of you who are lactose intolerant, grab a lactaid pill or eat some yummy sorbet. Here are some fun facts about ice cream. 1) The invention of ice cream is as messy as ice cream itself. Many people do not know the origins of ice cream, but either it dates to A.D 54–68 where Roman Emperor Nero is said to have sent his slaves into the mountains to fetch snow to mix with nectar, fruit pulp, and honey, though it is just speculation. Other sources claim in A.D. 618–907, China&apos;s T&apos;ang period, ice cream was probably a dish for the country&apos;s rulers. The founder of the dynasty, King T&apos;ang of Shang, kept 94 "ice men" on hand to lug ice to the palace to make a dish made of koumiss (heated, fermented milk), flour, and camphor. 2) Americans eat on average 20 quarts a year! That is enough ice cream to fill up 5 gallons of milk! That is a lot of dairy! 3) Vanilla is the most popular flavor. 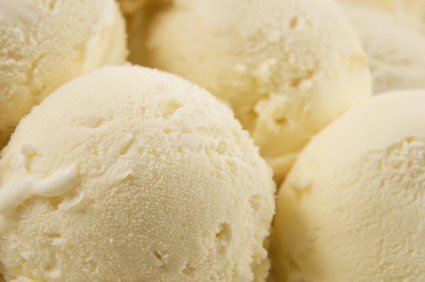 Vanilla takes up to 20-29% of overall sales of ice cream with chocolate coming in a distant second. 4) The largest ice cream cone measured 2.81 m (9 ft 2.63 in) in height and was achieved by Mirco Della Vecchia and Andrea Andrighetti of Italy. Vecchia and Andrighetti created the ice cream cone at a festival by Rimini Fiera and sponsored by Sigep, Fabbri, Incisoria Imar, Icam, Martellato at Rimini Fiera, in Rimini, Italy on January 11, 2012. The internal cone was made of wafer and covered with a 700 kg white chocolate cone then decorated with 2000 round wafer biscuits. 5) Some weird flavors of ice cream include buckwheat ice cream, beer flavored ice cream, and Parmesan gelato. 6) The ice cream cone was invented at the 1904 World Fair in St. Louis. Seven different accounts were taken about the creation of the waffle ice cream cone from the World Fair. Some claim Ernest Hamwi, a Syrian concessions vendor, curled a waffle cookie and transformed it into a receptacle for ice cream. 7) Ben and Jerry’s has 46 flavors. Some retired flavors include White Russian, Rainforest Crunch, Peanut Butter and Jelly, and Devil&apos;s Food Chocolate. 8) June is the month that the most ice cream is produced. 9) The central region of the U.S. created the most production of ice cream and related frozen products. It created producing 726 million gallons in 2011! Turns out all those cows and fields in the boring Midwest turns out something great. 10) Americans consumed about 1.53 billion gallons of ice cream and frozen products during 2011. Bonus Fact: The Michigan State University Dairystore (MSU Dairystore to Spartans) have created their own ice cream, sesquicentennial swirl, to commemorate MSU’s sesquicentennial celebration in 2005. It is a mixture of white cake batter ice cream with a thick green fudge swirl surrounded by green and white cake pieces. It’s always great to see freshies try and pronounce it.